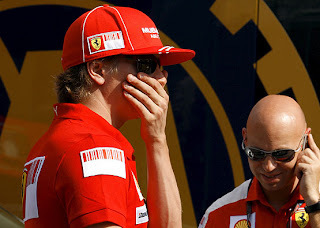 Kimi Räikkönen, Ferrari driver, was fined by the only policeman of Miane (Treviso), during his "recognition" lap along the route of the Rally of Marca. 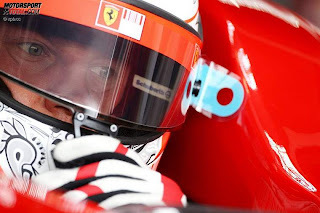 Raikkonen has paid without flinching an administrative fine of 38 euros for having invaded the opposite traffic lane, while he was trying the winding circuit over the hills of Treviso, where today there is the 26° edition of the race. "I stopped the car - said the policeman - contesting the invasion of lane to the pilot that I recognized and who spoke only English, a language that I don't know." A discussion, according the reports of the Tribuna di Treviso, lasted a few tens of minutes. "Nevertheless - added the policeman - we came at the head of the affair and he, quite correctly, has given his willingness to pay. Soon after I stopped for the same reason another car, nothing strange because when there is a rally, for safety reasons, I control on what pilots do to protect other road users. Kimi Raikkonen's asphalt rally debut came to an abrupt halt after he crashed out of the Rally della Marca on SS3 in his Abarth Grande Punto S2000. The car suffered rear suspension damage following an impact with a rock causing the right rear wheel to eventually come off and forcing Raikkonen to retire from the event. Raikkonen was lying in 17th position (8th in S2000 category) before the crash and set 14th fastest time (7th S2000) on SS1. This was his third rally in the Tommi Makinen Racing prepared Abarth Punto Super 2000. The rally was won by Italian Paolo Porro, in a Ford Focus RS WRC 06, who led from start to finish on the 9 stage event. Ferrari team boss Stefano Domenicali admitted he was very happy to see Kimi Raikkonen back on form at the Monaco Grand Prix. The Finn, who has not won a race in over a year, finished on the podium for the first time since last year's Brazilian Grand Prix. He also came close to securing his first pole position of the year, but was beaten by Jenson Button by just 0.025 seconds. 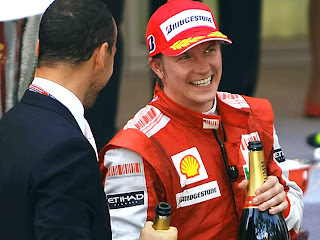 Domenicali said he was delighted to see Raikkonen show the kind of form that helped him take the title in 2007. The Italian also claimed Ferrari is now on the right track following a poor start to the season. "We're heading in the right direction, which is very important after the first part of this very difficult championship," said Domenicali. "The positive signs we've seen at Barcelona have been confirmed at Monaco. "I'm particularly happy for Kimi, he had a wonderful weekend: he missed the pole by a blink of the eye and in the race he might have done better, if there hadn't been the problem during his second pitstop. "On a track where talent is important Kimi has shown what he is able to do." Kimi Raikkonen is convinced Ferrari will win races this season after the team's promising performance at the Monaco Grand Prix. The Italian squad endured a dismal start to the year, but seems to have turned the corner following the introduction of an upgrade package in Spain. Raikkonen scored the team's first podium of the season in Monaco, with Felipe Massa coming home in fourth to complete Ferrari's strongest outing of the year. Now the Finnish driver, who was disappointed with third position, reckons it's just a matter of time before Ferrari wins again. "I wasn't too happy with the third place at the Monaco GP. For sure it was the best result of the last times, but that was nothing new to me and we knew that we could arrive on a place on the top," said Raikkonen. "When the leaders in the championship are so far ahead in the classification, in the end it's only a victory that counts. Being back on the podium is a nice reward for the whole team. The hard work of the last weeks finally bears some fruit, which is really positive for all of us. "We know that we're on the right way now: there are still some minor things to be done but sooner or later we will win. "We'll show up with further improvements of the F60 in the upcoming races and we hope we can then challenge the leaders even more, in the qualifying and in the race." Raikkonen, who started the race from second place, felt missing out on pole position was a big handicap for him. "The Monaco qualifying is so much more important than on other tracks and we've almost done a perfect job: we missed the pole by 25 thousandths of a second. Not starting from the first position means that it's very likely you won't win. Furthermore the second position on the grid doesn't help on this track. "You start from the dirty side of the track and whenever I found myself in this position I always lost at least one position in the field, because the tyres spin a lot at the start. In fact Rubens overtook me, which was really a shame. If I had managed to stay behind Button I think I could have easily opened a gap. "In the end it was difficult to fight for second position and then there was this story at the last pitstop, where we lost a couple of seconds, due to a problem with the right rear wheel. When I took up the race again I was further behind the Brazilian than before. "We brought home both cars and gained some important points. There were many things at Monaco we can be satisfied with." 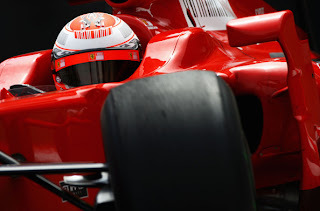 Q. Kimi, a great return to form for Ferrari. Talk about being beaten off the line by Rubens and then your day thereafter. 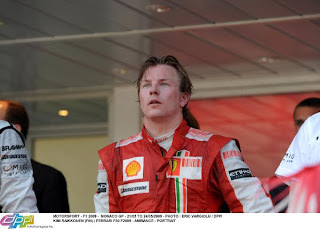 Kimi RAIKKONEN: Yeah, it is not the first time when I have been in second place and always lose one position. The start seems to be very slippery on that side plus they were on the softer tyres, so it definitely helped at the start. It was not nice to see as we were faster than Rubens but there was no way past him. We lost a lot of time at the beginning and that was the only chance to try and stay behind Jenson. Then I had a little bit longer second stint. I don't know what happened at the pit stop but we lost a lot of time and Rubens was still a long way ahead of me when I came out. We still have work to do to be where we want to be and fight for the first place. But many small things changed this weekend as yesterday being first place probably would have given us a better chance. We need to be happy after a very difficult start to the season. The people have been working very hard at the factory and here at the circuit, so we improved the car very quickly once we realised we can do something different with the rules. We need to be very happy with what we achieved today. Third and fourth is not bad. We should get some new package again for next race and it should help. I am disappointed, definitely, but in this situation we need to be a bit happier. I am not happy with third place but for the team it is still a good result. 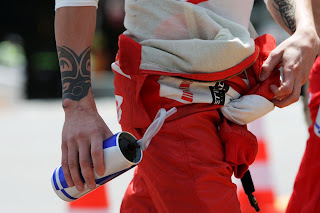 Q. Kimi, you spoke about the start to Peter Windsor; did you use KERS at the start? KR: Yeah, but there's not much use for it if you start spinning your wheels straight away, so that's where we lost the start. At any other place I could have kept second place. You gain a lot with KERS on long straights but it doesn't really make much difference here. It's more the first jump off the line. They had soft tyres, we had harder ones. The right hand side is probably a little bit better for the start anyhow. We just lost it there. It was all fighting after that. We were faster when Rubens had his problems with the tyres at the beginning but then after that, it all played out with very similar pace. We went a little bit longer in the second stint but they seem to be faster in the pit stops. I don't know what they did but we were still a long way behind when I came out of the pits. That's how it went. Without being third at the start, we could probably have taken second place but it's still not what we wanted really. I think, overall, we're not fast enough really yet to fight for first place. We need to be happy; we've still got good results for the team compared to what we had in previous races this year. It's disappointing to finish third but good for the team and for sure we're happier now as a team and we're scoring points. We'll probably get a little more peace now from everyone as a team. We're coming back but it will take a while before we're exactly where we want to be but we definitely made big steps in recent months. We need to be positive. People have done a really good job at the factory and at the circuit to push hard, so we're starting to get results and that always helps people to push harder. Q. (Heikki Kulta – Turun Sanomat) Kimi, did Felipe make it difficult to keep third place? KR: It wasn't easy for me. I needed to push all the time. We tried to push anyhow, to jump Rubens in the pit stops but we couldn't. I didn't know how many more laps Felipe had than me but I knew that it was going to be close but in the end it was not very close. I was pushing all the time anyhow. We knew it was going to be pretty tight but in the end it turned out to be pretty easy. After that we could slow down and just save the brakes and tyres and speed up a little bit at the end because there was one of the Red Bulls catching us up, so we just had to pick up the pace a bit. But apart from that, after the last pit stop it was great. Q. 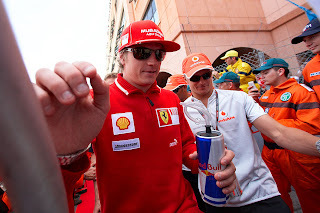 (Livio Oricchio – O Estado de Sao Paulo) Kimi, you made your second pit stop before Massa like the first one. Do think that if Jenson Button left the pits after the second pit stop behind Massa, do you think your place would have been at risk? KR: I'm not interested in even thinking about it. Why should I? I was third in the end, that's the end result. I came in early because at the first stop we tried to jump Rubens because he was so slow with the tyres. We were forced to stop a bit because the people behind us were catching us quickly, so that's why we were earlier than him but in the end we were third and it doesn't matter what they did, that's where we ended up. Incredible but true: thanks to the agreement between Club and Motoring Tommi Makkinen Racing, the champion of Ferrari will race with an Abarth Grande Punto Super 2000, while Italian champion earth, Mauro Trentin, will have a Subaru N14. 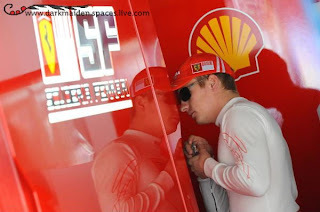 You want to keep a secret like news: Kimi Raikkonen to make the Rally! We wanted to be arcisicuri that was before to give it to print, knowing how delicate situation which affects every primattori sport, let alone a world champion of Formula 1 in full swing. Then it happened that the Finnish driver, releasing a "harmless" interview to the Official, has left to escape an enigmatic "I'll make a rally later this month in trevigiano" and that there are just other races except make the weekend of May 30 ... So is everything done? 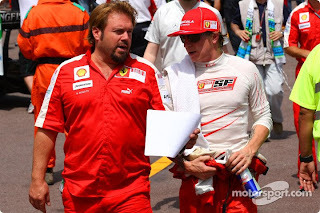 The initiative should not have to say, the volcanic Gabriele Favero, so that argument: "It is implementing the project to run the Ferrari driver, Kimi Raikkonen, the Rally of the Brand with the colors of the Motoring Club The idea was born in January this year when, on behalf of the four times world rally champion Tommi Mäkinen, the Motoring Club withdrew dall'Abarth a Grande Punto S2000 to deliver it to Raikkonen, who then played the Artic and the Rally Rally of Mikkeli in Finland, realizing his desire to run in the rally for fun. In both races Kimi was assisted by the structure of Tommi Mäkinen Racing who also follow the Rally della Marca, in close collaboration with the Motoring Club E 'known by many people, the historical friendship of our association with the automotive world lately is that Finnish is transformed into a close relationship of technical collaboration with Tommi Mäkinen Racing, competing in the World Rally Championship and Cup Trophy with Subaru Subaru Impreza N14 Finnish Team. In this regard, there will be to make a double novelty: a Subaru Impreza N14 will be entrusted to the Italian champion in 2008 Mauro Trentin land, while under the supervision of Tommi Mäkinen, will be made of pre-race test for Raikkonen, Trentin and strong pilot bellunese Massimo Cesa. A dutiful thanks goes to the president Luca Cordero di Montezemolo to the precious blessing, to Kimi Raikkonen for his sportsmanship and Tommi Mäkinen to the great availability. " Derapate enthusiasts and controsterzi and ferrari fans pistaioli, can therefore prepare for the big event, without exaggeration affection towards Algida Kimi, he would like an invitation to enjoy "quiet" for a moment to detach the plug from the difficult time of Cavallino rampant. I wasn't too happy with the third place at the Monaco GP. For sure it was the best result in the last time, but that was nothing new to me and we knew that we could arrive on a place on the top. When the leaders in the Championship are so far ahead in the classification, in the end it's only a victory that counts. Being back on the podium is a nice reward for the whole Team. The hard work of the last weeks finally bears some fruit, which is really positive for all of us. We know that we're on the right way now: there are still some minor things to be done but sooner or later we will win. We'll show up with further improvements of the F60 in the upcoming races and we hope we can then challenge the leaders even more, in the qualifying and in the race. The Monaco qualifying is so much more important than on other tracks and we've almost done a perfect job: we missed the pole by 25 thousandsth of a second. Not starting from the first position means that it's very likely you won't win. Furthermore the second position on the grid doesn't help on this track. You start from the dirty side of the track and whenever I found myself in this position I always lost at least one position in the field, because the tyres spin a lot at the start. In fact Rubens overtook me, which was really a shame. If I had manaaged to stay beind Button I think I could have easily opened a gap. In the end it was difficult to fight for second position and then there was this story at the last pit stop, where we lost a couple of seconds, due to a problem with the right rear wheel. When I took up the race again I was further behind the Brazilian than before. We brought home both cars and gained some important points. There were many things at Monaco we can be satisfied with. I'll race in a rally in Italy next Saturday, in the Marca Trevigiana, and I want to thank the Scuderia that they gave me the possibility to take part in such a competition. I really enjoy myself and it will be my first experience on the tarmac after some tests on snow last winter. As I'm coeing from the race track it will be intersting to see what I will be able to do behind the wheel of the Fiat Grande Punto S2000 on the roads close to Treviso. Kimi Raikkonen said his third place finish at the Monaco Grand Prix had to be considered as a good result for the Ferrari team, given the steps forward it has made since the beginning of the season. 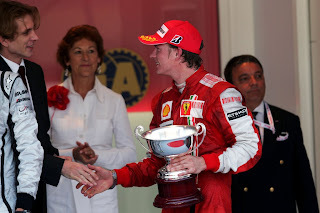 The 2007 world champion started from the front row and ran within a handful of seconds of Rubens Barrichello's Brawn for most of the race, giving Ferrari its first podium finish since last year's Brazilian Grand Prix. "We need to be happy with this result, given the way the team started the season," said the Finn. "Of course in the bigger picture I'm not happy with third place - I'm disappointed. But, in this situation, for the team it's a good result." Raikkonen had expected to challenge pole-sitter Jenson Button for the lead into Ste Devote on the opening lap, due to the Finn having a lighter car and the added advantage of KERS under acceleration. Instead though, he lost a position to Barrichello, and was unable to improve his position over the course of the race. "It is not the first time I have been in second place and lost position at the start," Raikkonen added. "It is very slippery on that side [of the track], and they were on the soft tyres at the start, so that definitely didn't help us. "Then I had a little bit longer second stint, but in the second pitstop, Rubens got a long way ahead. I don't know what happened there. "We're still not where we want to be – we have many things to do to be able to fight for first position – but the people are working very hard at the factory and we have improved the car quite a lot at least." 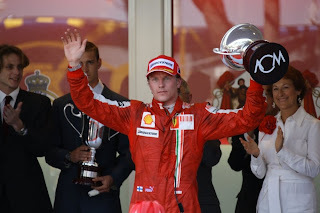 Q. Kimi, the first front row start of the season. It looked like you had the pace all qualifying and for a while there you were on pole and then right at the end it was Jenson that got it. Kimi RAIKKONEN: I mean the car hasn't been too bad here. Since the first practice it has always been getting better once the circuit has been picking up the grip and in qualifying the car was good. In the first qualifying it was a bit difficult and I made some mistakes and I didn't get a very good lap. The second qualifying was good and then in the last one it was good. I had one more lap and I went off in the first corner, so I don't know if it would have made any difference but it was a good result for us especially in this kind of place. The car has been behaving pretty well, so it is nice to be back on the front and hopefully we can fight for victory tomorrow. 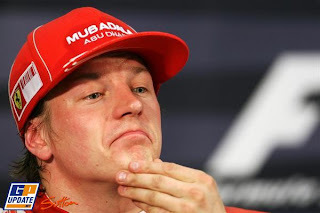 Q. Kimi, your third time starting from second on the grid. You said on Thursday that things could be better. What sort of improvements have you made to the car? KR: I mean the car is basically the same as the last race, so in that way we haven't changed it. There are still a few issues that are hurting all the time but we cannot change it right now. It is mainly for me but that is how it is. I mean it has been pretty good. On Thursday it was okay but all the time when the circuit seems to pick up grip we seem to improve the handling, so that seems to be a benefit for us. I am happy we are second after the start of the season but here it is not very good, so I am pretty disappointed not to be at the front as that gives you a massive edge in the race and that is more or less the only way to win the race, so we will see what we can do tomorrow and try to go for a win. Q. How much satisfaction does this give you after the season you have had so far? KR: Not much. I would rather have been in the front. It is nice to be second but still we lost the first place for a small margin but that's what we are aiming for and once we get there I will be happy. But especially in this race. In any other race it maybe doesn't make much difference but here the difference is much bigger between first and second. But it is going to be a long race, so we will see what we can do. Q. I think the team said that the car was better on the soft tyres rather than the super softs? KR: No, I did my fastest lap on the softer ones. Both of them work very well but they seem to be best. Q. (Heikki Kulta – Turun Sanomat) Kimi, is KERS your weapon against Jenson at the start? KR: Here it can maybe help a little bit but it's such a short straight to the first corner, it's very tight, it's very difficult, you need to really have a jump. Much better to be able to beat the first guy but we will try, we will try what we can and see what happens. 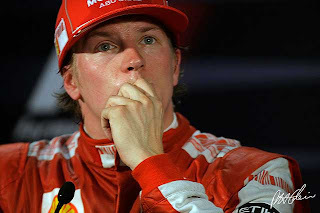 Q. Kimi, given your difficult start to the season will you really risk everything for a victory tomorrow or will you try to ensure some good points? KR: I'm only interested in winning, so I have nothing really to lose. OK, the team needs points but in the end they are happier with a win than just some points. We're not really in the championship. We know that the team has not had a very easy time this year but we have shown some signs that we are getting better. We still need to work. This is a special place, so if we have good speed here, I wouldn't say that we would be where we want to be on a good circuit, maybe not as good as Brawn, so that's what we're really aiming to improve, so I will definitely try to do everything that I can. Q. We've seen the car is much quicker now, so what can we expect in Monaco? 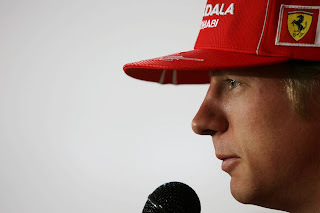 Kimi Raikkonen: It was definitely better in Spain. We made a step forward but this race is always a little bit different compared to normal circuits. I think we will do the best we can and see how it goes tomorrow. It is too difficult to say where we are going to be. Q. Ferrari is going to use KERS this weekend. How helpful can it be in Monte Carlo? KR: It should be helpful, otherwise we wouldn't have put it on the car. It is the same story as at other circuits we have been using it, but maybe it is not as big a help here as it was compared to the last race. Q. How would you describe the mood inside Ferrari at the moment? KR: It is as good as before. Of course, when you have not such good results as you want, it is always not as good a spirit as normal because everybody wants to win and wants to push hard - so sometimes there is a bit of tension. But, overall, the people are the same. It is the same kind of work and we want to get back where we should be. Q. And what about yourself? Do you feel 100 per cent comfortable? KR: Yes. There is no reason why I shouldn't. The things are the same for me as they were before. Q. So what about the rumours that Fernando Alonso is replacing you? KR: I've always said the same answer. I don't even need to say it again - we can wait until next year and then we will find out. I know what I am going to do, so I cannot even be bothered to talk about all those stories. So you can decide yourself and then we will wait and see what happens. Q. The courts in Paris rejected the injunction attempt by Ferrari. What is your personal opinion about this situation for F1 and Ferrari? KR: For me, first of all, it is not good for F1 on any side to have this sort of thing going on. For me, if Ferrari is not in F1 nor any other big team like BMW or McLaren, it is not good for F1. They are the teams that make F1 and if you change the teams for other teams, new teams that come from GP2 or somewhere else, then it is not the same any more. For me, I am 100 per cent behind the team and whatever they choose to do, I will go with them. Hopefully everything will get sorted out, but I am not the guy there working closely with them, so you need to ask the team for all the details – and probably also the FIA. Q. Do you feel more a Ferrari driver or an F1 driver in this moment? KR: I work for Ferrari and we are one big family. So it is my work and it is the place where I want to race. Whatever they do, I will do the same with them. We are one family and we do things together. Q. If you in the future are just a spectator of F1, would you go to the races and spend 500 Euros on a race with small teams competing? KR: Like I said before, F1 for me is all about the big teams. We race together and try to be the best. That is my opinion, but everybody has their own ideas – and probably when I stop in F1 I will not come to races anyhow. I will stop when I have had enough and then I will have no interest to come and see it. Q. The car was quite good at Barcelona but because of strategy problems and reliability the result was not so good. How frustrating was that? KR: Of course it was even more disappointing because we saw the car was fast and we could not get the results we wanted. That is how it goes in racing, but at least we know we have made the first step forward. We still have work to do, but we are coming back and that is always nice – even if we didn't get the results we wanted. Q. Is there too much pressure on Ferrari for making mistakes? KR: Probably it doesn't help, but like I said we made some silly mistakes, we will try to learn from them and try to make sure we don't repeat those things. Unfortunately sometimes it happens, but we will get it right – although it is taking longer than we want. Q. Jenson Button has won four grands prix. Is he unbeatable, and who could beat Brawn GP? KR: There can be many drivers who can do it, but of course they look very strong right now. I am sure there will be other teams winning races later this season, but with all the different rules people have, and different situations with cars, they definitely are ahead of people right now. We could see already at the last race that it is getting closer again. Q. 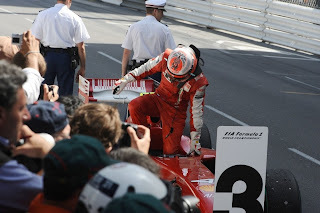 They say there is no margin for error in Monaco, so where can you make a difference? KR: You make the laptime around every corner, so you need to be fast in every place. The most important thing is to get the car right and then just build up the speed – but you need to have a strong qualifying and it is pretty difficult. Usually you get stuck behind people and can only follow them and unless something goes wrong you cannot do anything to use your own speed. Q. Last week you were in Maranello for an important technical meeting and to analyse the performance of the car, and mistakes. How was the meeting? KR: It wasn't what you are thinking. I was there, but it wasn't the reasons that people were talking about – it was just a normal visit I decided to do there. By many different things it happened to be at the same time, so it is normal that we go over sometimes and see people and go through things, what we did in the past races. We just analyse and try to improve. 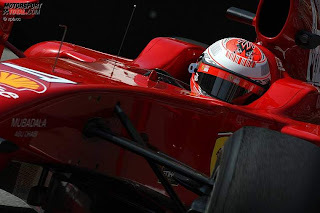 Q. Ferrari has said it will maybe not participate in F1 next year, and you are doing a rally next week. If they retire from F1, will you split immediately to rallying? KR: I am pretty sure that we are not going to disappear from F1. But I don't know, but I cannot be 100 per cent sure. For sure they will find something to do for me, I will still have a contract with them – and they are racing in many different categories. So, I think they will find something for me. With fans looking through the chain fencing separating the harbour from the motorhome paddock, Kimi Raikkonen faced the press this afternoon as, in Monaco, Wednesday is the same as a Thursday at all other races, given that practice takes place tomorrow. He began with a look back at the Spanish Grand Prix. “The car was definitely better in Spain and we certainly made a step forward,” he began. “That race was particularly disappointing as we could see the car was quick enough, but problems prevented us getting the results we wanted. We have made some silly mistakes and the important thing is that we have learned from them and hopefully that means we won’t repeat them. At least it showed we had made the first step forward, although there is a lot more to do. Q. Where will you be in 10 years? KR: I dunno, I mean I'll have nothing to do with Formula One, so maybe do some motorsports for fun, and have a family probably. LH: Still racing I guess. Q. The best thing about F1? KR: Probably the PR stuff! LH: There is no worst. KR: It's my passion, it's also my work, it's what I like. KR: A nice place, I've been many times in Spain in racing and testing. Ferrari president Luca di Montezemolo is convinced the Italian marque can find the same level passion in other racing series if it leaves Formula 1. The Maranello-based squad, the most emblematic team in the sport, said on Tuesday it will pull out of Formula 1 if the budget cap regulations introduced by the FIA for 2010 stay in place. The threat was followed today by one by Renault, who also said it will reconsider its position. Ferrari said on Thursday it had received "numerous" messages of support from its fans, to which di Montezemolo responded on the car maker's official website. The Italian said if Ferrari quit F1, it would continue to race elsewhere with the same level of enthusiasm. "I want to thank you personally for the numerous messages of support we received from all over the world over the last hours on our website and via email," di Montezemolo wrote. "It is important to know that we can count on the support of our fans all over the world and that our fans completely share the motivations, which brought us to take such a decision. "If we were forced to leave the Championship we were part of over the last 60 years of our history and where we set all the records in terms of victories, it is because they want to change the nature of its founding values. It’s always a very special week, the one of the Monaco GP. It’s a unique track where the qualifying is more important than on the other tracks and we have to try to implement it in the best possible way, learning from the lesson we were taught recently. I’ve never been very lucky during the two Monaco weekends as a Ferrarista, but I really hope that I can end this streak of bad luck. The F60 improved a lot at Barcelona and now a place on the podium is no longer a mirage. It will be very important to see how things go during the free practice session to understand if we made up some ground also on this track, like it happened in Spain. Last year we were able to place both cars in the first row and it would be a dream to repeat that. We’ll use the KERS also at Monaco: it might not have the same advantage as on other tracks, but anyway there’s a performance improvement. 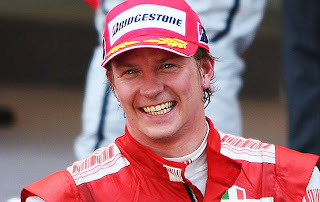 Raikkonen: "I can’t imagine a Formula 1 without Ferrari"
"It’s difficult to think of a Formula 1 without Ferrari. When I drove for McLaren the Scuderia from Maranello was the benchmark, the competitor you had to be compared with. Since I arrived here I understood that it is much more than just a team, it’s a legend, perpetuated via its road and racing cars. I always had the passion for racing with everything with an engine and I always thought of Formula 1 as the pinnacle of motor sports, in terms of competition and technology. Obviously if there really were rules like the ones set by FIA, it would be difficult to imagine a Formula 1 we had until today. Massa: "There will always be a Ferrari on the track"
“I understand the motivation, why the Company got to this point. The idea of having a Championship with two velocities, with cars, which for example are allowed to have flexible wings or an engine without a rev limiter, is absurd. We’ve already seen this year that the rules’ uncertainty not only led to a lot of confusion for us involved, but mainly for the fans. Imagine what might happen with what has been set up for 2010. Ferrari have announced that they will withdraw from Formula One if the FIA implements its plan to introduce a budget cap. In a short statement on the team's website, the sport's most famous team said they will not be on the grid in 2010. "We confirm our opposition to the new technical regulations adopted by the FIA and do not intend entering our cars in the 2010 F1 Championship," the statement read. Ferrari are among several teams to have been angered by the FIA's plans to impose a £40million budget cap on teams from next year, and today's move will hugely increase the pressure on FIA president Max Mosley to find a compromise. Crunch talks were already planned in the next few days with the May 29 deadline for 2010 entries fast approaching. Prior to the Spanish Grand Prix, Toyota boss John Howett said his team were unlikely to commit by that deadline if the FIA pressed ahead with their plans, but it is Ferrari who have made the move first. Tuesday's announcement will put to the test Mosley's resolve after he claimed earlier this month that Formula One could live without Ferrari, the sport's most famous, most successful, and longest-tenured team. Ferrari are the only team to have contested every season of the World Championship since the modern format was introduced in 1950. But more than that, the tradition of the famous prancing horse has long been synonymous with the sport, and the team are the most popular among F1 fans. The decision to threaten to pull out of the 2010 championship came at a meeting of the Ferrari board of directors in Maranello. Ferrari believe the FIA's new regulations would lead to an unacceptable two-tiered F1 Championship, which they consider would be "based on arbitrary technical rules and economic parameters". "The board consider that if this is the regulatory framework for Formula 1 in the future, then the reasons underlying Ferrari's uninterrupted participation in the World Championship over the last 60 years - the only constructor to have taken part ever since its inception in 1950 - would come to a close," said a report from today's board meeting. The report went on to criticise the FIA's decision-making process, claiming that teams have not been properly consulted. The report continued: "The rules of governance that have contributed to the development of Formula 1 over the last 25 years have been disregarded, as have the binding contractual obligations between Ferrari and the FIA itself regarding the stability of the regulations. "The same rules for all teams, stability of regulations, the continuity of the FOTA's endeavours to methodically and progressively reduce costs, and governance of Formula 1 are the priorities for the future. "If these indispensable principles are not respected and if the regulations adopted for 2010 will not change, then Ferrari do not intend to enter our cars in the next Formula 1 World Championship." Felipe Massa finally scored points for the first time this season, picking up the three that go with sixth place in the Spanish Grand Prix. The Brazilian appeared to be heading for a fourth place finish, maybe even a podium, but he slithered down to sixth in the closing stages due to a fuelling problem, which meant he had to slow to save fuel. His team-mate Kimi Raikkonen had climbed up the order until he looked set for a points finish, but an accelerator problem forced him to retire on lap 17. The race was dominated by the Brawn team with Jenson Button winning from Rubens Barrichello, with Red Bull’s Mark Webber joining them on the podium. There is a saying in the paddock that, if Formula 1 was easy, everyone would do it and today’s qualifying performance from Scuderia Ferrari Marlboro was a perfect illustration of that cliché. This is a sport where the difference between success and failure is always poised on a knife edge. Felipe Massa had a great session to make it through to the final part of qualifying, before taking fourth place in the top ten shoot out. From where he starts, with the F60 much improved with the new package brought to this race, the Brazilian has a real chance of making it to the podium tomorrow. However, bitter is the only way to describe the Scuderia’s feelings after a bad error of judgement saw Kimi Raikkonen’s qualifying end in Q1, with a start position of sixteenth. Prior to the session, the strategists calculate what lap time should be sufficient to make it through to Q2 and after Kimi’s run, it was felt he had done enough and that it was better to save a new set of the faster softer tyres for the next part of the session. It proved to be a bad choice, as the Finn dropped out of the top 15 and into the relegation zone. His afternoon was over. Once again, championship leader and winner of three races this year, Jenson Button, steered his Brawn to another pole position, just beating Sebastian Vettel, the only other man to win so far this season, in the Red Bull Renault, in the dying moments of Q3. It was a thrilling few minutes that had the crowd on their feet. Inside Felipe on row 2 is his fellow countryman, Rubens Barrichello in the second Brawn. While behind them, Mark Webber (Red Bull Renault) and Timo Glock (Toyota) occupy row 3. There are two Ferrari engines on row 8, as Kimi finds himself alongside the Toro Rosso car of Sebastien Buemi. It seems it would not be a Grand Prix weekend if the weather experts did not predict rain for race day and indeed, that is the case for tomorrow. Usually, drivers at the front end of the grid favour a straightforward dry race, while those at the back pray for rain to capitalise on unforeseen circumstances, therefore the two Prancing Horse drivers could line up with different aspirations on this front. So you can relax and enjoy ice cream, you also enjoy rallying what was the Artic Rally like? It’s completely different to F1 and when it’s new it’s exciting. I’ve wanted to do it for many, many years and when I got the chance, I did another rally afterwards. There are so many things to learn but it’s a big challenge and I enjoyed it. In the future after F1 can you see yourself as a rally driver or following Mika Hakkinen into DTM? DTM definitely not, I’m not interested but rallying is something that has always been a good sport and probably when I stop F1 I will try and do more rallies and perhaps take it seriously so we’ll see what happens. What about your future in F1 can you see yourself getting as many Grands Prix as you can? No, not really. I’ve been enough in there and I have no interest in just driving around for races or the teams. I’m happy where I am now and I have a contract for next year then it’s more or less my decision what I want to do. We’ll see how it goes and how Formula 1 is going first of all. There are a lot of question marks and nobody seems to know what kind of rules we are going to get. If there’s a £40m budget cap do you think Ferrari will still be in F1? I don’t know. There are a lot of question marks and I’m not the guy to answer those. Would you want to be in a series like that? I think this is not Formula 1 anymore and that’s why there is a question mark so we’ll see what happens but I will definitely finish my contract and then see what is happening but I’m not in a hurry and we’ll wait and see. What would you like the future of F1 to be like? Do you think there should be a budget cap? There needs to be some reasonable budget for everybody but it’s hard to put the bigger and smaller teams on the same level so it’s very difficult to make everybody happy and that’s the biggest issues. It would be nice to get more close racing but we are getting into that area and it still needs to improve. This season can you still fight for the world championship or is it over for 2009? The next few races will show which way we are going to go but we know it is going to be difficult. Some teams are faster now than us and it’s never going to be easy to catch them up. We can win races this year but I’m not so sure we can fight for the championship. But we’ll keep fighting and see what happens – we don’t give up that’s for sure. Montmelo, 9th May 2009 - At the end of Saturday's qualifying day at the Catalunya Circuit, the teams declared the weights of the cars for tomorrow's race, in kilograms.. Some people have said that Ferrari is lacking a leader, do you think you can motivate the team? There are always stories about who is doing what but people hardly ever know what is going on. There’s always someone blaming someone if we are not doing well but we have good people, good working relationships and these are the same people who last year were winning races, so it’s not like we don’t know what to do. Unfortunately we just haven’t got it right this year and once we start winning all the stories will be nice but that’s part of the whole thing. Hard publicity comes with hard times. When you wake up in the morning, what’s your motivation? Of course, when you’re winning it’s easy but when you’re not doing so well you are waiting, especially when you know there are improvements to the car and you can get back where you want to be. There’s always some motivation, we always want to improve. But I love the racing and the other stuff is on the side. I love the racing and that’s the main thing. Even when you don’t have the best car you try to get the best out of it and when you get the results you get a nice feeling out of it. Some people have doubted your commitment and motivation. In Malaysia, for some reason you were in your shorts eating an ice-cream out of the car – it looked as if the team were quite surprised. It’s nothing. I was retired and nobody else was running either. I had an issue with my car and I wasn’t going anywhere so it’s a big story out of nothing so it’s normal, I can do what I want when I retire. You always get the nice stories out of things so I don’t mind. I’ve been long enough in the business to know and I don’t really care what they write about me. We didn't really know what a Kimi Räikkönen is -- or how the hell to pronounce that last name -- but apparently he's a Formula One driver we happened to shoot in London yesterday ... and he's loaded beyond belief!!! The speed racer raked in $44 million last year and is the 4th highest paid sportsman on the planet -- but the exuberance doesn't stop there. 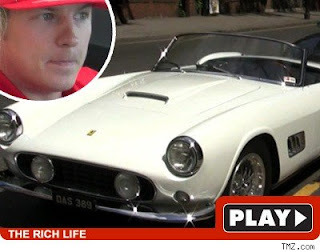 Also worth millions: That sweet, white, old school Ferrari California parked in front of Kimi's sweet, metallic, new school Ferrari. Maranello, May 6th 2009 – Ferrari Formula One driver Kimi Räikkönen today officially opened the UK’s first Ferrari Store at 193-197 Regent Street in the very heart of London. 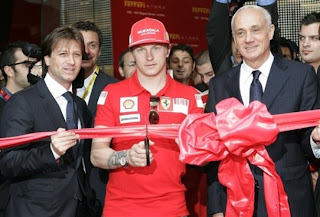 The ribbon-cutting ceremony was hosted by Räikkönen and Dany Bahar, Ferrari Senior Vice President, Direzione Commerciale & Brand. The Ferrari driver then performed the now-traditional signing of the store counter after which there was a special reception for a select group of guests and Ferrari Owners. The day also featured a spectacular display of both new and classic Ferraris which, having first called to the Store, parked on Conduit Street for all to admire. The design of the two-storey 530 square metre London Ferrari Store is entirely the work of the Studio Iosa Ghini. The design concept sees the Store as much as a homage to the history and spirit of Ferrari’s twin souls of racing and luxury as a straightforward retail outlet. Each area of the Store has thus been carefully designed as a unique, special space in which shoppers can truly embrace the Ferrari experience. Needless to say, the Regent Street Store offers a wide selection of products from the Prancing Horse ranges for GT car clients, Formula 1 tifosi, and Ferrari enthusiasts. The Regent Street Store joins the other prestige Ferrari Store locations worldwide, including those in Rome and Venice (Italy), Barcelona (Spain), San Francisco and Miami (USA), Macao (China), Abu Dhabi (UAE), to mention but a few. It was created and will be managed by the Percassi Group, a high profile Italian and international retail company that also owns the Ferrari Store in Milan which opened its doors in September 2005. The Ferrari Store development programme includes plans to bring the number of openings to more than 40 over the next three years in Europe, America and the Middle and Far East. 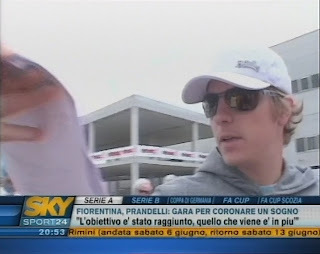 The following interview has been released to BBC from the Finnish driver of the Scuderia Ferrari Marlboro. Kimi you’ve just opened the Ferrari store, do you have fans wherever you go or can you still be a bit low-key? If I go on my own time people don’t expect me to be somewhere. If I come on my own probably people don’t notice me but this is work and so isn’t private. We’re about to fly off to Barcelona, can you believe it’s been a year since you’re last victory? Yes, sometimes it goes like that. If you think it’s a long time but the time goes quickly in F1 and hopefully soon we can win again. The car is a bit better now so I expect us to be a bit stronger but I don’t know how much the other teams have improved so we need to wait and see. If someone had said to you, you would only have three points going into this race would you have believed them? I don’t know if it’s bad luck we’re just not as strong as we should be. You cannot expect anything in F1, it changes so quickly. We are in a situation right now and you just have to try and get out it and try to improve and get back to where we should be. What updates will you have on the car? We have a new aero package. We have done some straight line testing but from there it’s pretty hard to say how much better it will be. Definitely it should be better than the last races. From your point of view as a driver how much do you enjoy driving for Ferrari as a prestige brand? Do you want the team to regain its history? Of course, we’d rather have good races and results but racing is sometime like this. Ferrari is a perfect place to be racing as a team and with the people so I wouldn’t really change to another team. I’ve been with a few other teams in F1 but Ferrari is in many ways a different place. I’m very happy to be there. Of course, we’re not as happy as maybe we were last year because we are not winning but that’s normal in any racing so once we start winning it’ll be more happy but the atmosphere in the team hasn’t changed. Kimi Raikkonen was F1's last year's "fine-king". F1 Racing -magazine has summed in its newest issue the given fines at last year's races. The magazince counts that Raikkonen's total amount of fines were 15 000 euros. Raikkonen got four tickets from pit-speeding. Also his total amount of fines was increased by him being late from the press conference in France GP. Rubens Barrichello got the second biggest sum of tickets, 14 000 euros. David Coulthard, who ended his F1-career after last season, had to pay fines 12 000 euros. 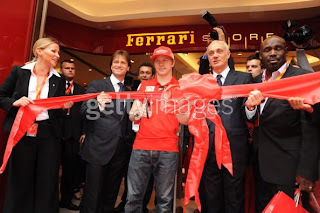 Maranello, April 3rd 2009 – The first British Ferrari Store will be officially opened on London’s chic Regent Street on May 6th in a ceremony attended by Scuderia Ferrari driver Kimi Räikkönen. From today, however, Prancing Horse enthusiasts will be able to shop at the Store which is located at number 193 – 197 Regent Street. Inside they will discover the entire range of Ferrari products for Formula 1 tifosi, GT enthusiasts, children and collectors. A replica of the F2005 will take pride of place in the main window and is also on sale at the various Ferrari Stores as well as from Maranello itself. Photographs and a virtual tour of this latest Ferrari Store are also available through the Company’s brand-new www.ferrari.com portal. There are currently 25 Ferrari Stores, over half of which are in leading cities outside of Italy. The next new Stores to open will be in Dubai, Jeddah, Bahrain, Florence, Athens, Bucharest and New York. All of our retail outlets are franchises with the exception of the original Ferrari Store which opened in Maranello in 2002 and is owned and run directly by the Company. The London Store is managed by the Percassi Group, a high profile Italian and international retail company which also owns the Ferrari Store in Milan which has been in business since September 2005. Paris Match is one of the most prestigious publications in France, and are keen to run an interview, I'm told, with France's next Formula One superstar. They want to do a piece on GP2 driver and Renault's third driver Romain Grosjean, but the request for an interview has been turned down. Why would this be? This is great exposure for Grosjean, GP2 and Renault. As always, I suspect there is more to this than just a missed opportunity. My initial thought was that Grosjean may, therefore, be on his way out. But Renault love him. So why then? Could it be that Renault intend to pull out of F1 this year? I'm adding two and two and making five, but I think it's fair to say there would be some PR embarrassment if Renault hailed it's new French saviour only to pull the project and leave the poor lad racing in the Andros series. Carlos Ghosn, the company's president, has little emotional attachment to F1 and has stated over and over again that the manufacturer will only remain in F1 as long as there is a quantifiable return on its investment. There's no doubt that Renault - like every other car manufacturer - has seen it's profits axed as the car market grinds to a halt at the side of the road. F1 is a very public way of spending a lot of money at a time when shareholders demand a tightening of the corporate belt. 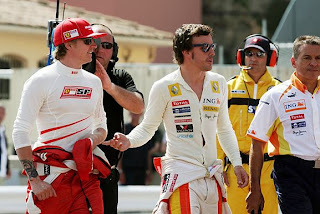 I'm told by a third party that Mark Webber has tried to convince Kimi Raikkonen to join the GPDA. Kimi is now the only driver who isn't a member. 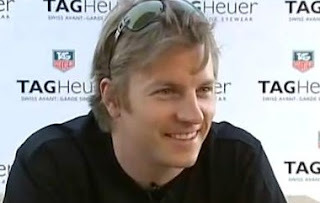 When asked why, Kimi apparently said there is no point, because he won't be around next year. That would leave the door open for Alonso. 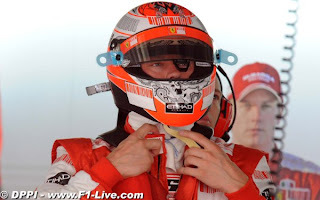 Felipe Massa should be safe because talk of Robert Kubica going to Ferrari has died down. Kubica is not getting on very well with his team BMW Sauber, but I'm told his focus is on Barrichello's seat at Brawn for next year. So watch this space - for a man who was tipped for the title this year only to score zero points from the first three races, Bobby K has been looking surprisingly happy with himself of late. Somebody reminded me that it's been over a year since I last won a race. Oh well, you can't change that afterwards into anything else but it could have gone the other way too. After last year's Barcelona we missed out a few times. It could have been possible to win at least in Magny Cours, Montreal and Spa. I still haven't forgotten how winning feels. And that's what I'm after - as fast as it's possible. After four races far away it's always great to come back to Europe. I also like the circuit in Barcelona a lot. I've had two victories from there. It's a good circuit and a good place for me. I received happily the data I was provided by our team about how our new aerodynamic functioned in the first test. I'll go to Spain on Thursday and it's exciting to test in Friday practice all the new parts that we now have in the car. I'm sure every team has done their best so that their cars are in the best stitch. That's why it's vain to give any big promises at this stage. Let's just look how the first race goes and I think it gives us the line of direction where each team is heading right now. We tested in Barcelona in March but it's no use to draw any conclusions based on those tests. In tests you don't even know how heavy the other cars are. Now the cars have changed a lot and the proportions of power are now at least somewhat different. Ferrari has a new aerodynamic that should give more downforce compared to what we had in the first four races. When all the others have gone forward too, one can only wish that we have made most progress. In Barcelona the aerodynamics is a real key-thing if you want a good laptime. It's technically a really demanding place and if you want to be in the lead your car has to be really competitive. It's a big difference if you get to start the race from the lead. We saw in Bahrain how difficult the start becomes when you have to start far behind the lead. It has never been easy to overtake in Barcelona. Let's hope that the KERS will help but overtaking always depends on the circuit and the situation. KERS will definitely be an advantage in the start but if all the KERS-cars are in the lead and everyone pushes the button in the same place, then it's useless. Let's wait and see what we can accomplish. I already have three points and it was good enough to get even the 6th position in Bahrain. Now with the new parts and the team's hard work we should be stronger. There's been a lot of talk about a place on the podium but it can't be promised beforehand. But of course the goal is to fight for the prizes. I was in Switzerland during the break. I trained a little and went to check all Finland's games. After a couple bad games Finland won superbly Canada. There was the zern like it should be. They showed that you do not give up and it's always worth to fight for the victory. Just like I'm going to do in Barcelona.